This was the only individual of this species that I saw in Ghana. I was walking along a dirt road dotted with mud puddles when this frog's movement in some vegetation at the side of the road caught my eye. It was a pretty little frog, clearly different from the many many Phrynobatrachus accraensis I had been seeing. 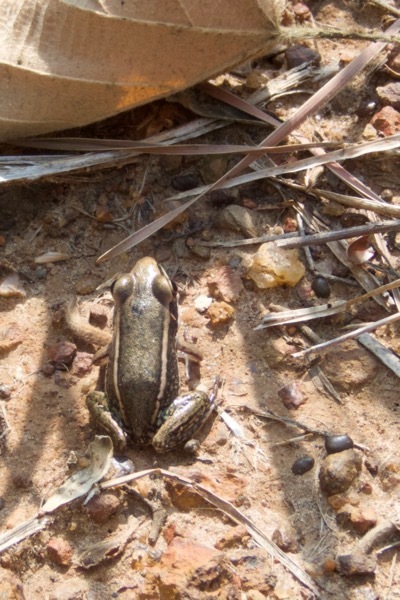 I nudged it into an open area and lined up for a nice side view, which would show off the frog's colorful speckling. The frog had other plans though, and turned at the last instant before my shutter clicked, leaving me with only this lame photo. An instant later it had leaped away into vegetation and I could not find it again.